Hallfield Lane Cemetery and ‘The Church on the Corner’, with its 2 small chapels, are situated in a quiet secluded area close to the centre of Wetherby. 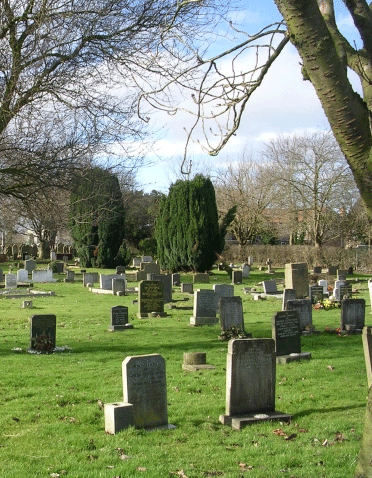 The Cemetery is maintained by Wetherby Town Council and is looked after on a day to day basis by the Cemetery Superintendent who is happy to welcome visitors to this beautifully kept churchyard throughout the year. Burials can take place on any weekday except Bank Holidays. Arrangements can be made for a service to be held in one of the small chapels if required. Graves, either for full interment or for ashes can be arranged by the funeral director or may be pre-purchased. There is also an area which is reserved for the scattering of ashes. For further information please get in touch with the Deputy Clerk, who will be happy to talk to you and answer any questions you may have. Please click here to view the Cemetery Fees.